I have often talked of my love for Maharashtrian food. Though the fare is simple and healthy, it never fails to please my palate. The minimal use of fat and spices allow the flavours of the ingredients themselves to come through without being overwhelmed. Case in point - Shrikhand - hung curd flavoured with cardamom to make a really refreshingly, tangy dessert. Or Amti - made out of lentils which are eaten in other parts of India as well, but just a variation with tamarind / tempering / Goda masala /coconut makes all the difference. Food blogging has allowed me to rediscover many of the favourites I grew up eating at my neighbour's house or even at home,when my mother tried replicating dishes she had tried outside. Not only are some of my favourite food bloggers Maharashtrians, but there have also been the food blogging events which brought so many regional dishes into the limelight. So then, it was a matter of time before I heard of Ruchira - one of the earliest Marathi cookbooks written by Kamalabai Ogale and published when she was sixty. It is apparently in two parts and the more I read about how indispensable it was for a young bride's trousseau, the more it reminded me of Meenakshi Ammal's Samaithu Paar - the first Tamil cookbook which was equally cherished by a whole generation of young brides. Like Samaithu Paar, Ruchira has also been translated into English - albeit in an abridged form. People seem to agree that many nuances of the original may have been lost in translation. But when I came across a copy of the English version, I had to grab it! The recipes are all simple and most of them are not more than a page long with about 10 ingredients - tops!. There are some places where some ingredients have been missed out and some measures are not very precise, but nothing which a cook with basic knowledge will not be able to assume correctly. So, the immediate Sunday after I acquired this little gem of a book I tried out the amti and vange bhaji for lunch. 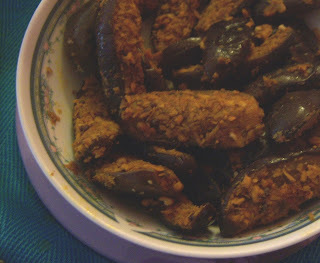 Vangi means eggplant in Marathi and this particular recipe was simplicity personified. Onions, a couple of spice powders. a dash of tamarind juice and coconut to round it off. 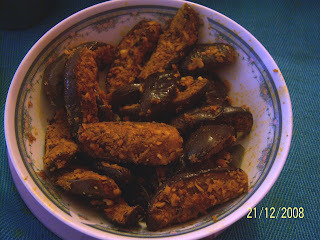 Perfect morsels of crunchy coconut covered slices of soft,spicy eggplant - delicious! 1. Cut the brinjal into 4 pieces in lengthwise and immerse in salted water. 2. Meanwhile, heat the oil in a pan and add the mustard seeds, when they sputter add the hing and the turmeric powder. 3. Lower the flame and add the brinjal pieces. Fry on high for 5 minutes, then cook covered with a sprinkling of water if needed for about 10-12 minutes till tender. 4. Add the chilli powder, goda masala, salt, jaggery and tamarind juice and cook till soft but not mushy. 5. Add the coconut and the peanut powder, stir and remove from flame. Dear Miri, wish you a fabulous new year filled with much love and joy! i love marathi cuisine too, must be college canteen hangover! i make this baingan subzi almost the exact same way (with lots of chopped coriander)- whats goda masala? Goda masala is this absolutely amazing smoky masala unique to Maharashtra - adds an undescribable flavour to amti and bhaji. You get Bedekar's Goda masala readymade. Miri- that looks just wonderful! Your description and pictures suddenly filled me with longing for this delicious vangi bhaji. My grandmother makes a very similar version. Wishing you a year of tasty cooking, eating and blogging ahead! Love Maharastrian cuisine, very interesting recipe...first time here, love ur blog...great job! That Baingan looks delicious. I am a big fan of Baigan. All those masala coating it...yum.